Our pals need to get Minnie a surprise present, so they keep her busy with plenty of chores to do at the Clubhouse. Tired from so much work, Minnie falls asleep and dreams that she is MINNIE-RELLA! Inspired by the fairy tale of Cinderella, the story of Minnie-rella sparkles with music and fun as we recognize our favorite Clubhouse characters in familiar roles. The Mickey Mouse Clubhouse: Minnie-rella DVD comes packaged with the full-length adventure, a FREE Castle Play Set, 3 additional Mickey Mouse Clubhouse episodes and 10 Minnie’s Bow-Toons Shorts! 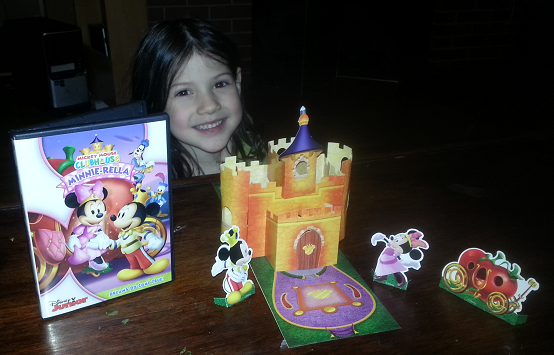 My daughter Joey and I reviewed Mickey Mouse Club House Minne-Rella. This also came with a buildable castle that we built together. We enjoyed the episode as well as the extra episodes on the DVD but building the castle was a big bonus we were not expecting. I was surprised by how much fun we both had building a little cardboard castle but it really was a fun and special time. We had a lovely Sunday Mommy Daughter Movie Day and then played with the castle before she went to bed. I would definitely recommend especially on these long, cold winter evenings. If you have fans of The Mickey Mouse Clubhouse in your house, I would definitely recommend buying this latest DVD, that's now out and available in stores today! Disclosure: All opinions are my own. I received Minnie-rella on DVD at no cost for the purpose of this review. No other compensation was received.